Sen. Debbie Stabenow (MI) receives one of Ducks Unlimited's highest honors for her contributions to wetlands and waterfowl conservation. 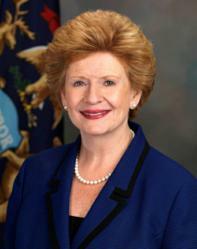 Senator Stabenow continues to prove she is an effective leader and conservation champion. Sen. Debbie Stabenow (MI), chair of the Senate Agriculture Committee, was presented last Friday with the 2013 Wetland Conservation Achievement Award, one of Ducks Unlimited's highest honors. "Senator Stabenow led the Senate in passing a comprehensive, bipartisan farm bill in 2012 – one of the few major pieces of legislation passed by the Senate last year," said DU CEO Dale Hall. "The Senate version of the 2012 Farm Bill was a shining example of prioritizing the long-term conservation of wetlands and waterfowl habitat." Conservation provisions in the 2012 Farm Bill included a national Sodsaver program, re-coupling crop insurance with conservation compliance and a robustly funded easement program, which included permanent, 10-year funding. The bill was not passed in the House. "It is an incredible achievement to have directed a bill to Senate passage with so many important conservation triumphs, especially in today's partisan atmosphere," said Dan Wrinn, DU director of public policy, who co-nominated Stabenow for the award. "Senator Stabenow continues to prove she is an effective leader and conservation champion." The senator has also been a supporter of the North American Wetlands Conservation Act (NAWCA), Great Lakes Restoration Initiative, Great Lakes Fish and Wildlife Restoration Act and is leading congressional efforts to keep invasive species out of the Great Lakes. "Senator Stabenow grew up in a rural area of Michigan and understands the economic importance of agriculture and of supporting sportsmen and women," said Pete Albrecht, DU Michigan state chairman. "She knows that farming and conservation must go hand-in-hand and she has continued to fight for farmers in Congress without losing sight of conservation priorities." Stabenow was first elected to the U.S. House of Representatives in 1996 and the U.S. Senate in 2000, when she made history by being the first female senator from Michigan. She was appointed to the Senate Committee on Agriculture, Nutrition and Forestry in 2009 and has been the committee chair since 2011. She is also a member of the Congressional Sportsmen's Caucus. DU's Wetland Conservation Achievement Awards recognize individuals who have made outstanding contributions to the restoration and conservation of North America's wetlands and other waterfowl habitat. To view all of the six 2013 Wetland Conservation Achievement Award winners, please visit http://www.ducks.org.